Today’s episode of Nuremberg Explored features the Henkerhaus (Hangman’s House), built together with the adjacent Henkerturm in the early 14th century as part of Nuremberg’s medieval city fortifications. 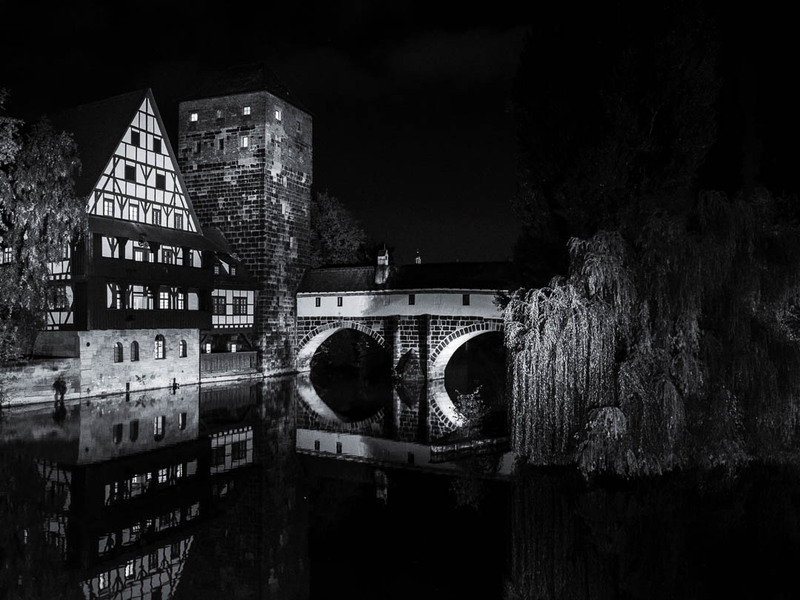 Situated in a sandstone bridge directly over the Pegnitz river the Henkerhaus is the former official living quarters of the executioner of the free imperial city of Nuremberg. The historic building houses a museum that offers fascinating views into the job and the criminal history in medieval Nuremberg. Much of the information comes from first hand, as Franz Schmidt, the most famous of the city’s hangman’s provided insights into his life by leaving us his diaries. Nurembergs Hangman’s lived their isolated lives in these quarters for almost 400 years from the 15th century to 1806. The buildings on the left are the Wasserturm (Watertower), built in 1320-1325 and the Weinstadel (Winehouse), a historic half timbered house that today is used as a student dormitory. I took the photograph with my Ricoh GR II with 1/6 sec, f/2.8 and ISO 1600. B&W conversion in Lightroom CC. Excellent image, Marcus. Great reflections. Excellent photo and an intriguing story. Little bits of history like this are fascinating. Excellent photo! I noticed that ISO is very high but the image is surprisingly clear. Did you use tripod or not? Thanks 🙂 I did not have a tripod with me as I took this photo on our way to our car after taking my wife to dinner in the old town. But I rested the camera on the railing of the bridge I took the image from. Despite its tiny size the Ricoh GR II has an APS-C sensor that produces very acceptable images up to ISO 1600 (my standard setting for low light shots on this cam). Thanks, your comment means a lot! The hangman’s house looks quite cute on top of the bridge. Gorgeous photo.